I wrote a blog post a couple of weeks ago about the release of the police files from the Bella in the Wych Elm case. 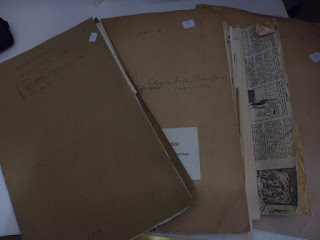 The files now reside in the custody of the Worcester Archives. I emailed them asking about digitization of the files, access, etc. The files have been digitized (yay!) and include about 1400 TIF files. The items include paper files, photographs, photocopies and one VHS recording of a Crimestalker TV programme. Many of the documents are duplicates. The TIF files plus an MP4 of the VHS program come out to about 35GB (a fairly significant amount of data!) And... the whole package "only" costs £275. That includes the USB drive that would hold all that data. When I think that the National Archives only charges £3.50 for some of the WW2 spy files... the Bella amount seems a little steep. enquiries resulting from writing on the walls at Oldbury, Halesowen, Birmingham and Old Hill, Staffordshire. There are numerous folios that deal with running to ground various possible victims. It all sounds very intriguing. The question is... is it worth £275?